There are other folk that suggest that I must have gone slightly doolally, trying to invent a more difficult puzzle than the one in front of me. Some have even quietly said that I am definitely seeing things when I suggested there’s a famous crossword editor hiding in Column 2, too. Coincidence? I think not! We are a long way from home, painting a fresco on a wall at the bottom of a cliff in the remote north of the Island of Ibiza, where Internet access is sporadic to say the least, so it was a relief when my blundering Ibizenco in an Internet cafe finally produced a Calmac crossword and not a Mash, a Sabre or a Quinapalus. As we drove the half hour home, I was happily slotting solutions of these very fair and generous clues into the grid but I didn’t forget to check Calmac’s continued right to entry to the Listener Setters’ Oenophile Outfit, and, of course he confirmed it several times. “Originator of pithy saying is tense outside public house (8)” gave us AORIST around PH = APHORIST. Then we had “Unaccompanied male consuming liquor is travelling by coach (7)” STAG consuming GIN = STAGING. “Problem drinker, one now reformed (4)” was a WINO. Cheers! Calmac – see you at the bar. By the time we reached home, something was emerging from our solving. “I believe this has something to do with the Arno,” says the other Numpty, “and those letter on the top row are spelling Ponte Vecchio.” “Firenze!” He announced moments later. By this time, the corrected misprints were producing TADDEO GADDI and Auntie Google was needed only to confirm that it was H W LONGFELLOW who wrote in Italian and English an ode on the Ponte Vecchio, the 1345 bridge that was traditionally attributed to Taddeo Gaddi. As usual we learned something new from this puzzle and enjoyed a gentle solve. Many thanks to Calmac. The HARES? Of course they were enjoying the Florentine sunshine, one up there under the bridge and the other in a rather jumbled straight line. 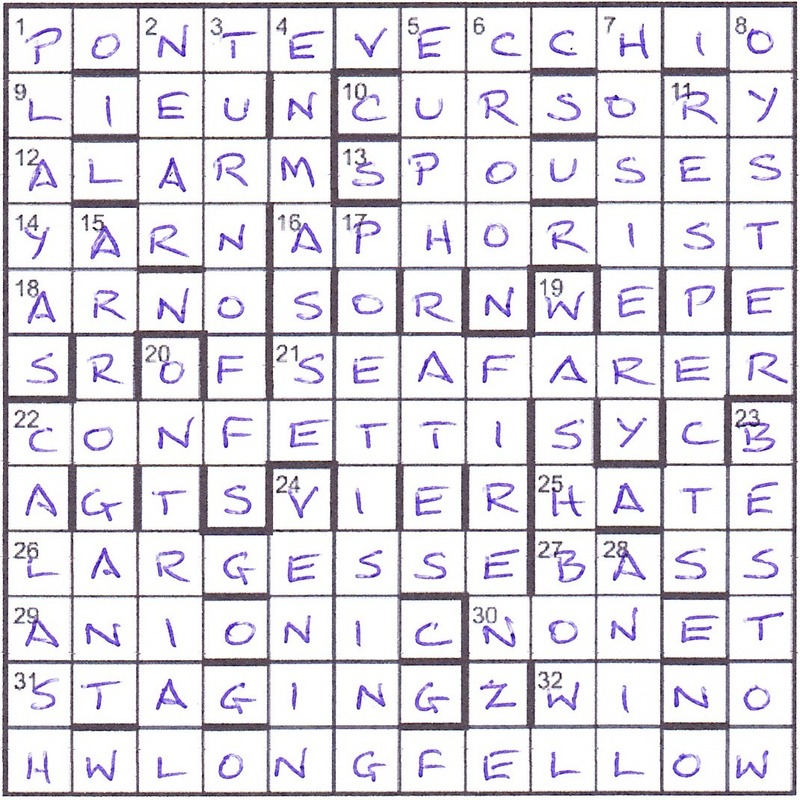 Three entries were unclued, and a third of the clues had a misprint. The correct letters and unclued entries would enable a work and associated people to be identified. All in all, this was one of the quickest Listeners for a very long time, not even 45 minutes. With most of the grid complete, a check on the unclueds (?) enabled PONTE VECCHIO, FIRENZE and H(enry) W(adsworth) LONGFELLOW to be fleshed out. The corrected misprints looked a bit odd, but when I had all eleven of them, TADDEO GADDI must be the culprit. Thanks for an easy week, Calmac, and for introducing me to ‘superheat’ as an anagram of ‘Euphrates’!